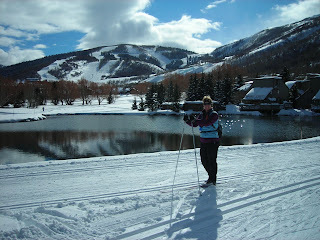 I've been spending a good deal of time working in Park City, Utah this winter. The details are another story for another time...but it's a great scene. Beautiful mountains, really fun town, endless system of trails, and that world-renowned Utah powder. Nearby family & friends are icing on the cake. 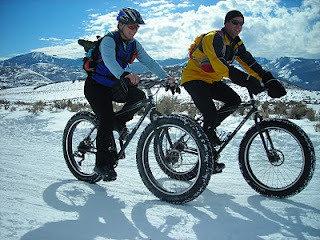 Joanne and I took the snow bikes out on the Round Valley trail system last weekend, and our new friends Bob & Leslie snapped this sweet photo. It was a classic winter day. 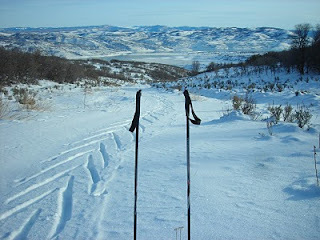 We've also done several ski tours near Jordanelle Reservoir, which provides singular mountain & lake scenery. Long herringbone climbs like this lead to awesome, flowing downhills. It's always a bonus when there's a fun payoff. There are something like 70K of groomed ski trails around Park City, most with stellar views of the surrounding downhill ski mountains. Here, Joanne pauses to take it in on the White Pine trail system. Sun, snow, endorphins and smiles...gotta love it. 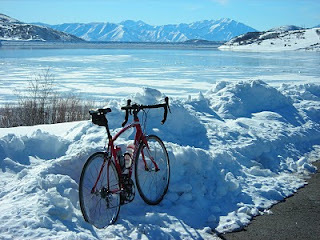 Several weeks ago, a mid-January thaw gave me occasion to get the road bike out on real pavement. I hadn't been on it since LOTOJA in September, and must say it felt awesome to be rolling down (& up, & up) the roads again. This pic shows a big view of Jordanelle Reservoir, Heber Valley and the backside of Mt. Timpanogas. Punxsutawney Phil saw his shadow today, so it will likely be a while before weather conditions allow for this again. Embrace the snow!